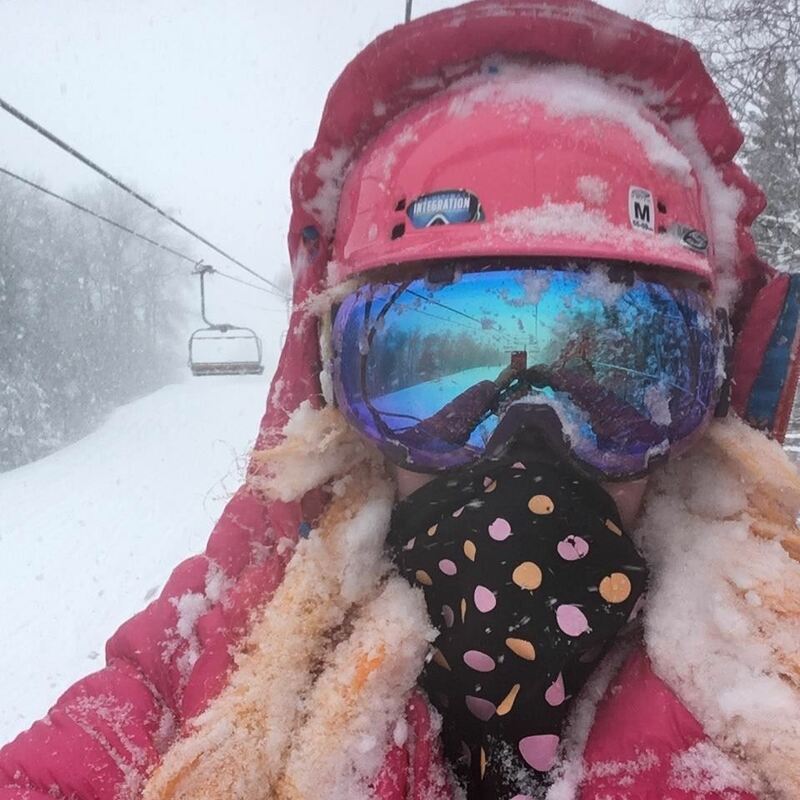 It's unexpected powder day! I woke up far too early this morning and saw some fat flakes falling but kind of assumed it was just a tease. The snow continued falling and picked up in intensity. So much so that my partner called me from the office just to tell me how much it was snowing!! I had returned my (compact SUV: snow driving appropriate) rental car the previous night, and was kicking myself for not having checked the weather. Just before noon, I sprang into action and booked myself a compact at the shop down the street, and off I went. I should mention, because renting in Quebec, you normally get winter tires, compacts have served me just fine this winter. Today: not so much. I picked up a Ford Fiesta and the wheels started spinning almost right away. Nevertheless, I hit the road, skis and board packed in this tiny car and off I went to Saint-Sauveur. It only took about an extra 25 minutes to arrive than normal - traffic was snarled even at 1:30 in the afternoon! I got to the hill and after managing some work related affairs, got ready and hit the hill about 3:30 or so. That only left about 1.5 hours to ski but some skiing is better than no skiing for sure! 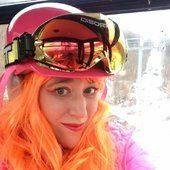 I had brought the lesser waxed skis which was maybe a mistake but the tradeoff was uncomfortable boots with the better waxed skis and I did not feel down for reliving my Sunday experience at Tremblant. After yesterday's rain, there weren't a whole lot of runs open, especially by the time I got there, so I only got to hit Red Robin, 70 Est and Jay - Epervier and Tom Barbeau looked open before my arrival, or someone was just poaching it. Since there weren't a whole lot of people there today, the limited availability of runs wasn't an issue and it was pretty easy to make fresh tracks all day long! The snow was coming down full-on when I arrived, and was cold enough that I actually had to wear my mask and full on goggles!! The usual seven minute cycle became a ten minute cycle with at least 15 cm of powder under my not-waxed-enough skis and it was fresh tracks each run!! Finally, at the end of the day, I piled into my last-minute rental Fiesta pretty drenched, and quickly realized I was stuck!! And no matter what I did I couldn't get out. Lucky for me, two guys who were also leaving late drove over and pushed me out, and it was hard even for them as the snow under the wheels had turned icy in the short time I'd been there. But also, pretty sure this car does not have winter tires!! I finished off the day with a quick stop at the Manoir St-Sauveur while I waited out rush hour and did some day job stuff, and thoroughly enjoyed their Irish Coffee along with a few super affordable and delicious bruschetta snacks. Here's hoping these great conditions hold out til tomorrow!! Did not get a lot of snaps - too wet to bust out the phone! But here are a few. A nice ride up the Atomic lift! Just look at that powder!! oh lawd it's coming down! This was just my second run! What I love about Saint-Sauveur is that even when the only lift open is the Atomic, you still have access to almost a dozen trails, and they are all fun and enjoyable. The core section of the mountain has a good variety. When you stop and think, Edelweiss feels like the size of just Saint-Sauveur's Atomic Express section. Glad to see you got out. Enjoy it while it lasts. Atomic is closing in less than two weeks now. Which will mean from that point on, it will most likely be only 70 Ouest, Nordique and Silver Park. Come on June 1st we can do it!! Even if it means hiking. Sommet Saint-Sauveur - December 31, 2018! On the second day in January 2019 I went back in time, to review the abundance of photos from our NYE experience at Sommet St-Sauveur! The mountain was offering an NYE dinner at 7pm with limited availability on the second floor of the T-bar, I actually missed out on the opportunity for the $109 per person tickets for that back in November, but then again, I'd rather be skiing at that hour anyways. I called in advance to find out that the first floor of the T-bar was business as usual for skiers, riders, and guests, only with a limited menu and much less seating than usual. The forecast was calling for 15-20cm of snow, but it hadn't started falling by the time we left home. The NYE festivities included skiing til 9pm, indoor and outdoor djs (which was great because if you disliked the track selection of one space, you could move to the other), a midnight countdown (champagne included if you had purchased a dinner ticket), and most importantly: fireworks! We arrived around 7:30pm, the Avila side was closed and so were the Atomic and La Fleche lifts. I was surprised Atomic wasn't running, but assume they were preparing for the fireworks show later on. L'Etoile, my favourite lift, was up and running, and the La Plagne access was already roped off by the time we got up the lift. The atmosphere was already festive on arrival, with the outdoor dj up and running and a crowd of people enjoying the outdoor bar. At that hour, trail selection was a bit limited, with Nordique, 70 Ouest and the Rockstar park fully open, and a cat trail over to 70 East. Still: skiing on NYE, can't complain! I was joined by my partner Scott and our friend Ilana. Conditions were hard pack granular and still pretty icy after the rain we had during the week, but not the worst I've seen. With a short line and a somewhat slow chair, we only got in 5-6 runs but they were good ones...and of course just after our final run it started snowing! We stopped into the bar for some snacks of wings and "rustic" fries and some pints of Griffintown, then headed back outside to settle in. The fireworks show began with a procession of lights at 10pm, I'm guessing it was the ski patrol and other mountain employees, each carrying a stick with flares (or LEDs?) at each end. They snaked down the bottom of 70 Ouest in perfect formation, and it was quite a sight, as the night skiing lighting was out, the red lighting of the flares cast a warm glow on the mountain. Following the procession, at 10:15pm, the fireworks show began! I managed to catch a lot of photos and some video as well. After the fireworks show, there was still just over an hour to kill until midnight. With all the snow falling, people were hiking up the Nordique with sleds and lunch trays for a snowy ride down, and the accumulation was fast enough that there was some soft cushioning. I took my first flying saucer ride in years!! And hiking in the snow was pretty great too. At midnight we popped the small bottles of Henkell Trocken we had brought with us, and rang in the new year right next to the trail map at the base. We did one more run on the flying saucer after that, before heading home. To my dismay, on the ride down the 15 south, the big fluffy flakes turned into sleet, and then freezing rain, and then just straight up pouring rain. It was a bit anticlimatic going from the winter wonderland back to the wetness of the city. 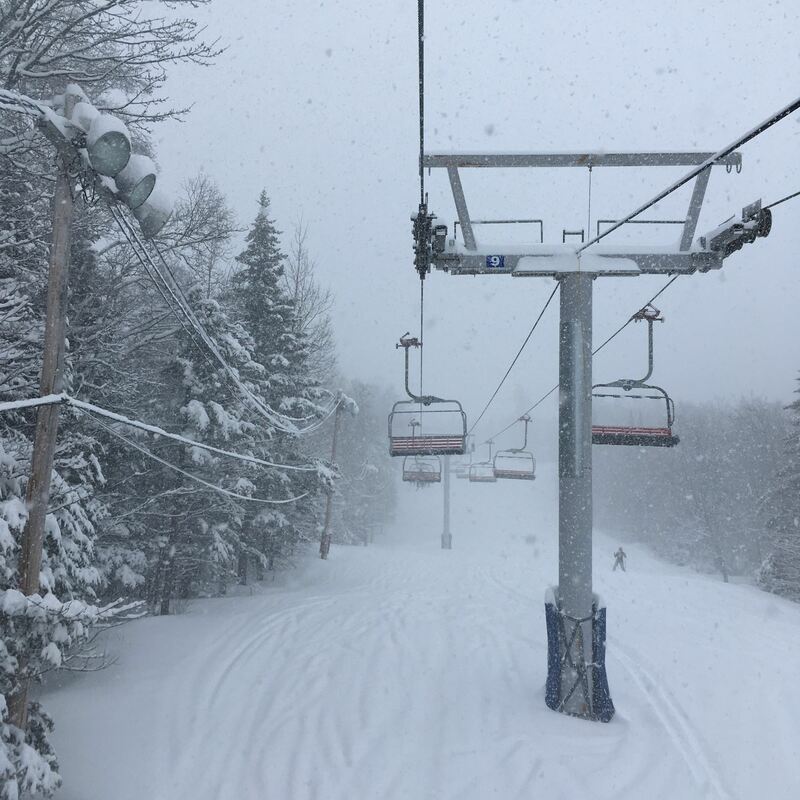 Fortunately, the snow continued at Saint-Sauveur making for a perfect first ski of 2019 as I wrote in my other post. Here's some snaps from the evening and a video of the fireworks! First ride of the night up L'Etoile! Getting ready for the first run of the night with Ilana! Looking down the 70 Ouest. Looking up the 70 Ouest on the last run of 2018! A crowd assembles at the chalet. The procession of lights begins! This was really quite spectacular to watch. Panorama from the bottom pitch of 70 Ouest during our last run. So close we could see the rockets launch! The next several shots are the best ones I captured of the fireworks! The chalet at the end of the evening. Below, a quick live show! After the previous evening's festivities, it took me a bit of effort to rally, but I finally talked myself into braving the dropping temps to head up to Saint-Sauveur, which would make up for my annual skipping of the Coney Island polar bear dip. Our day started with a 5pm brunch of mimosas, bacon, and eggs benedict (back story: Scott made a delicious ham and it is incredible on eggs benny!). After brunch I managed to locate all the items I'd shed the night before and a pair of dry mittens and headed up to the mountain. I arrived just after 8:30pm and while it was still busy enough that there was a wait to get on the Atomic chair, the crowd was thinning as the temperature dropped. Not wanting to spend a lot of time waiting in line, I headed over to Cote 68 and was rewarded with a nearly empty hill. There was some improvement from the iciness of the previous day, and the snow was fast and squeaky like fresh cheese curds. After a few runs I headed back over to the Atomic lift via Pingouin/Red Bird and then did a few easy runs down Jay and Red Bird. Jay was much icier than some of the other runs, for some reason. I saved the Cote 70 Est/Ouest bottom for the last run, figuring it would also be a bit icy, but the top half was pretty decent, and the bottom pitch of 70 Ouest was its usual mogul-ey goodness with just a few bare spots. So it turned out the glorious snowfall of the previous night helped improve conditions somewhat, but we could definitely use a few more dumps of snow after the conditions of the past week. It was a quick trip but a perfect way to start off the new year! Looking down Cote 68, decent coverage here. Looking up Cote 68 - there were just two skiers off to my right, but otherwise I had the hill to myself! Thanks to my (future) mother in law for the comfy and warm polka dot mitts! Taking the Atomic lift over Cote 70. The view from the middle of Jay! Looking au natural and a little rosy-cheeked in the car afterwards!